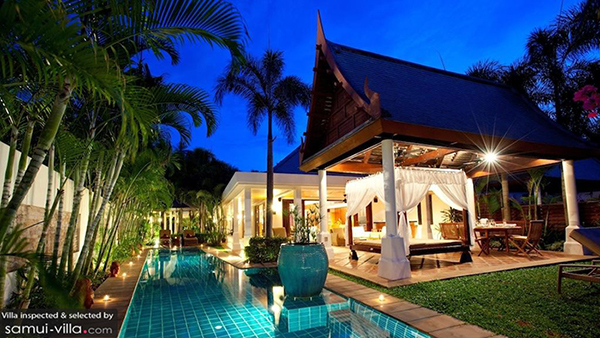 The well-equipped Villa See was built to impress. 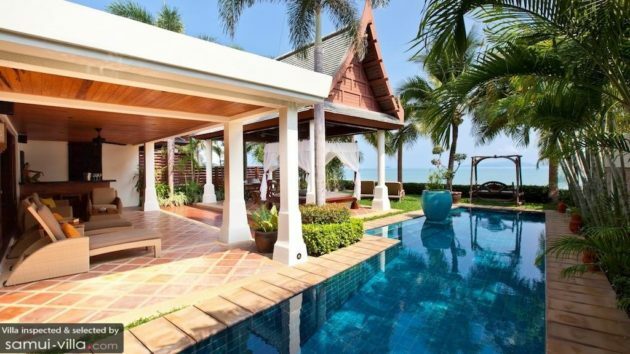 This capacious holiday home comes fitted with luxurious amenities like an infinity pool, gym and cinema, and looks out to Choeng Mon’s scenic coastline. Relax indoors in open-air living spaces decorated with a minimalist flair, or lounge outdoors in the sun-drenched grounds. You’ll be easily tempted into staying in through your vacation – don’t say we didn’t warn you! 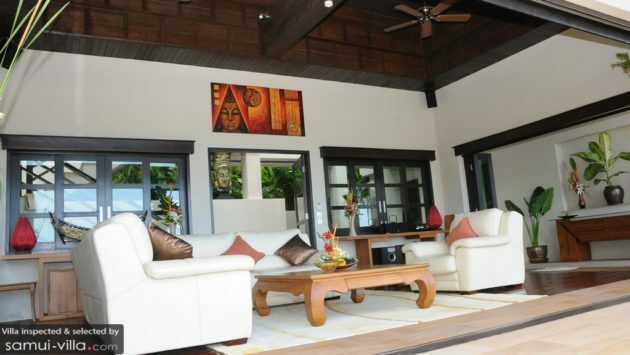 Golden Palm Villa is any vacationer’s dream vacation home in the tropics. Towering palms dot across the grounds, the grounds are lush and verdant and the surrounding landscape features abundant tropical greenery. With uninterrupted views out to the ocean, you’ll be itching to hit the coasts all day. 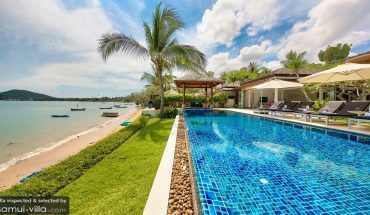 Thankfully, the home is just a skip away from Chaweng Noi beach, and once you’re out on the shores you’ll have a 37-foot power boat at your disposal for cruising across the waters. Yippee! With its elegant and contemporary decor, Villa Manola makes a great choice for travellers wth a taste for homes furnished with a modern flair. 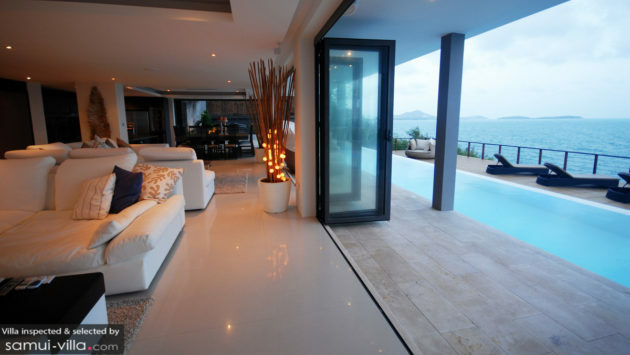 Enjoy breathtaking views out to the ocean from all around the home, and when you’re not lounging outdoors by the pool or at the breezy balcony you’ll be soaking up the warm, inviting vibes indoors. 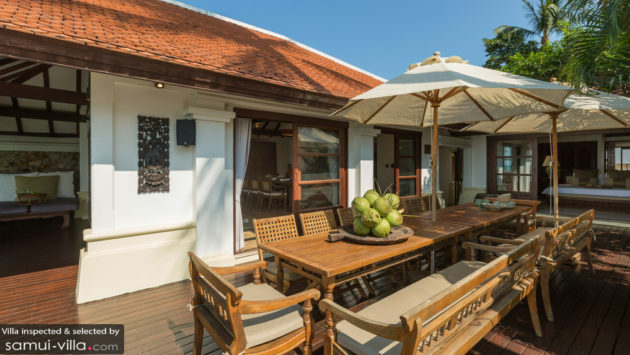 The rich, ornate decor of Tassana Pra – from the wood-dominated common areas to the ultra-luxe bathrooms and fully-equipped living spaces – makes it a place where villa vacationers can live large and in style. With amenities like a freeform pool, spacious soaking tubs and breezy outdoor hangouts, you’ll enjoy hours spent lounging in – but should you wish to venture out, a variety of restaurants, shops, water sports and nature attractions are easily within reach. 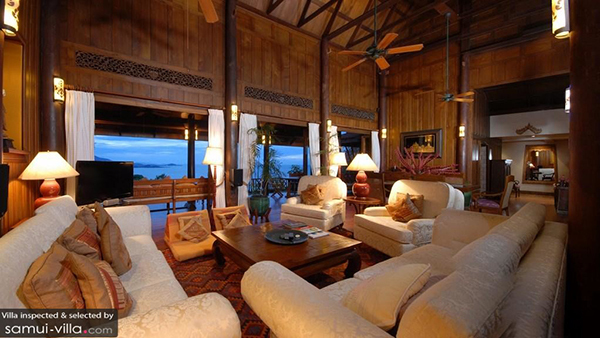 Three bedroom Baan Sawan is a cosy option for small travelling parties of six. 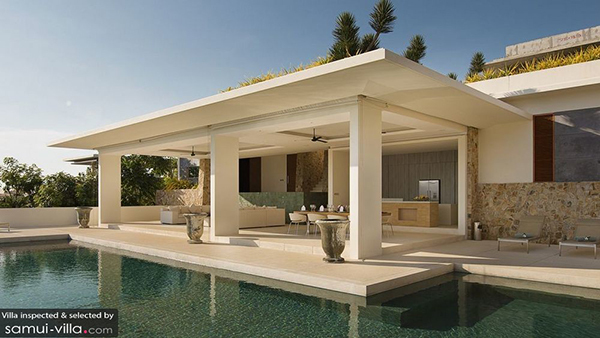 To top it off, the villa boasts prime beachfront location, unobstructed panoramas out to the ocean and a sparkling infinity pool with sea views – what else could you ask for in a tropical getaway? 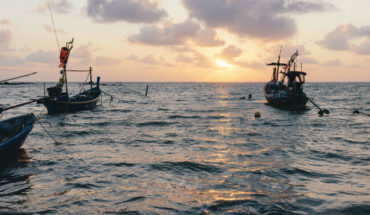 Nearby attractions: Fisherman’s Village, home to an array of shopping and dining attractions is located a stone’s throw away from Baan Sawan. 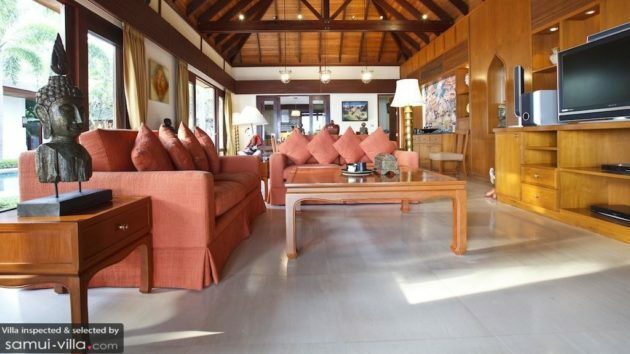 Large living spaces, splendid bathrooms with luxe fittings and amenities like a private gym are some of the perks you’ll enjoy staying in a vacation home like Ban Haad Sai. Invite your entire clan along for the holiday fun – with a total of seven bedrooms, there’s ample space to accommodate everyone! 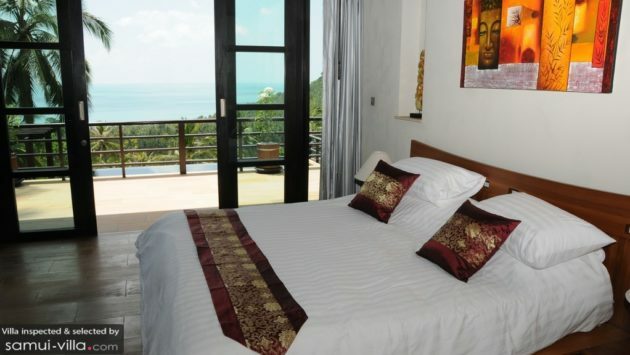 Nearby attractions: Big Buddha beach is just steps away from the garden of your villa. 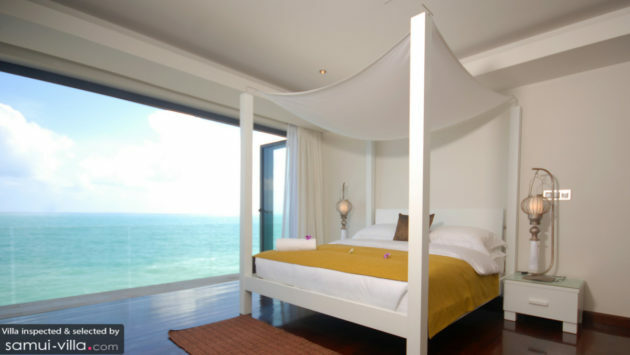 Chaweng, along with its array of dining, shopping and nightlife attractions are a 10-minute ride away. Relaxing at Villa Bougainvillea is an enjoyable affair, whether you’re lounging outdoors or in. 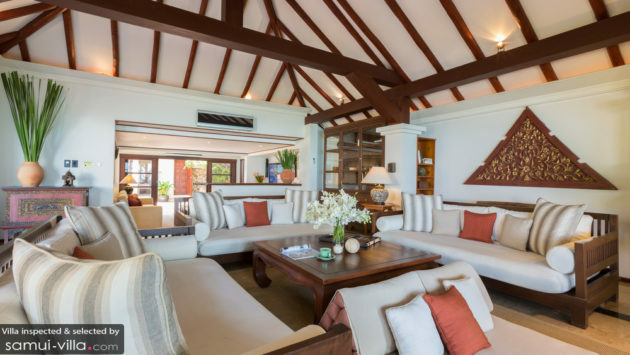 The villa’s well-appointed living spaces invite guests to curl up comfortably within, while the spacious grounds tempt sun seekers into soaking up the warm tropical vibes out in the garden or by the poolside. 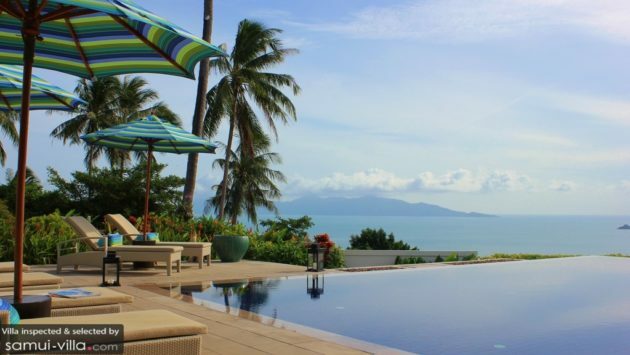 Nearby attractions: The beaches of Bophut and Mae Nam, as well as the Away Spa at W Retreat, Namu and Zazen Restaurant are located nearby. 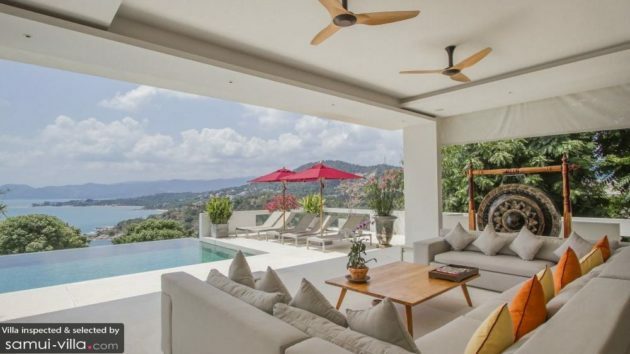 Villa Champak is a home that’s made just for beach lovers. A beach frontage that stretches over 25 metres sits beyond your garden, offering a swathe of fine, powdery sand and turquoise waters. And when you’re done frolicking along the coasts, rinse off the salt and sand in luxurious bathrooms and open-air showers located just footsteps away, before curling up for a siesta in the inviting living area. Have a great time unwinding! 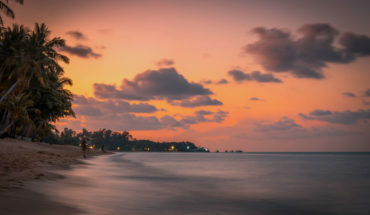 Nearby attractions: The beaches of Bophut and Mae Nam are located within close proximity to your villa, as are cultural attractions like the Wat Na Phra Lan. 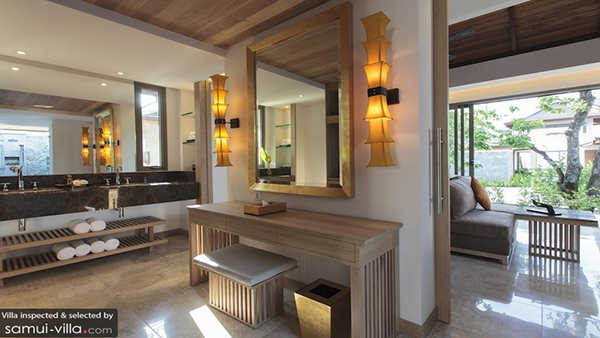 Away Spa at W Retreat, along with dining establishments like Namu and Zazen are also easily within reach. Featuring a multitude of private and common living spaces, seven bedroom Villa Sila makes a great bet for a large family getaway. 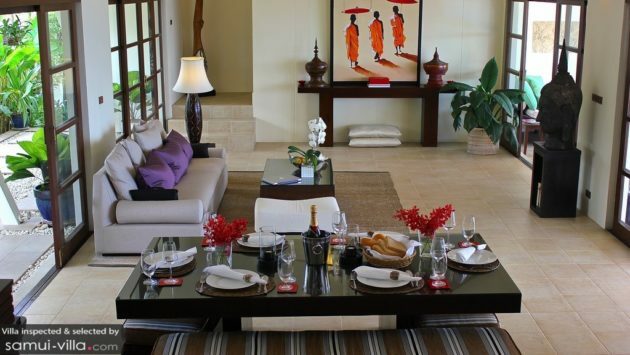 Round up friends and family for communal meals in the indoor dining room or al fresco feasts at the poolside sala. In your down time, make full use of the villa’s wide range of amenities, like the fitness centre, sauna room, multimedia room and spa sala. 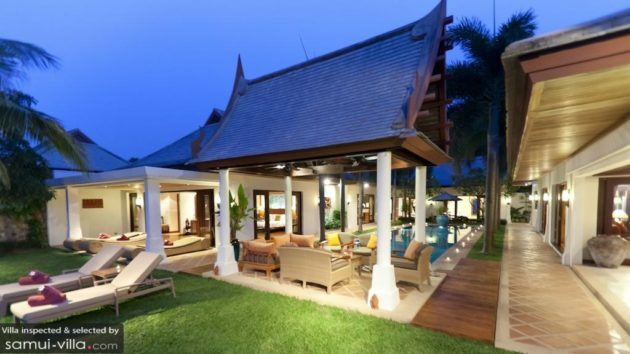 Nearby attractions: The beaches of Bophut and Mae Nam are located within close proximity to your villa. 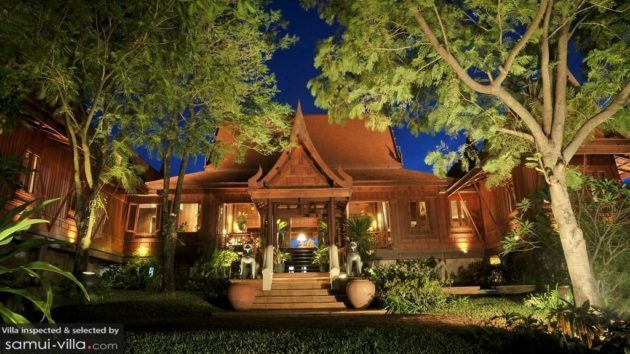 Take a quick stroll to the village of Mae Nam to take in the sights and sounds of a traditional Thai village. Planning a family trip soon? Travelling with little ones in tow can be tricky, check out the top tips to for a successful family holiday here.